The 2018 Jeep Compass is sleek and stylish. The aerodynamic design and athletic stance exude confidence and command attention on the road. The available black roof and chrome molding around the rear and sides of the vehicle give the Compass a sophisticated look and add dimension to the design. Daytime Running Lamps are available, as well as LED head- and tail-lamps. Available cornering fog lamps complete the lighting system and ensure that you will see and be seen in your Compass, no matter how dark it is. Inside the Compass, a versatile cargo area makes it easy to load up passengers and cargo alike. An available power liftgate allows you to open the rear door with the touch of a button. With the seats up and in place, you have room for 5 passengers and 27.2 cubic feet of cargo. If you are looking for more cargo space you can fold the rear seats down and reach 59.8 cubic feet of storage space for all of your gear! The Compass has a comfortable interior for passengers to enjoy. Premium materials line the interior and advanced technology allows you and your passengers to stay connected to the outside world while you are on the road. Leather-trimmed seats are available in a variety of colors for you to choose from, including black with tan trim, black with red stitching, sandstorm with dark saddle stitching and more. The Compass has a variety of Uconnect systems available as well. Each of these systems includes Bluetooth® connectivity, Voice Command, Siri® and has optional navigation and up to an 8.4-inch touchscreen display. A 7-inch Multiview Driver Information Digital Cluster Display is available on the Compass, providing real-time information related to your speed, media information, navigation (if equipped) and more all right in front of you in a full-color display. 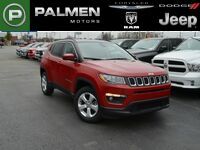 The 2018 Jeep Compass is available now at Palmen Motors. Browse our inventory and set up a test drive online today!